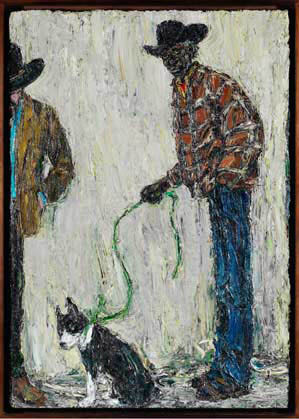 Nicholas Harding first painted Rusty Peters in 2002 and had a portrait of him hung in the Archibald Prize that year. However, it was a more formal study than this painting and he was never completely happy with it. ‘It was the year after the win and my head was a bit mucked around with all the fuss,’ says Harding, who won the Archibald Prize in 2001 with a portrait of actor John Bell. Born under a Warlagarri or Supplejack tree on Springvale Station, southwest of Turkey Creek, Rusty Peters is a senior Gija painter and songman, and helped started the art school at Turkey Creek. In 1989 he moved to Kununurra, where he was employed at Waringarri Aboriginal Arts as an assistant and became a long- time friend of Rover Thomas. In 1997 Peters moved to Crocodile Hole and began to paint on large canvases. Now the proud owner of one of Peters’ paintings, Harding subsequently met the artist at a couple of openings of his shows at Grantpirrie Gallery and was able to study him more. ‘I liked having the figure of Tony in terms of composition,’ he says of this portrait. Born in London in 1956, Harding came to Australia in 1965. He completed a bachelor of arts in 1975, travelled through Europe then returned to Australia to a career as an animator, illustrator and painter. He has had regular solo exhibitions at the Rex Irwin Gallery in Sydney since 1992 and a solo exhibition in London in 1997. He has been hung in the Archibald Prize on ten previous occasions. His portrait of Margaret Olley was highly commended in 1998 and he pulled off a double in 2001 when he won the Archibald Prize and the Dobell Drawing Prize. Last year he was represented in the Archibald, Wynne and Sulman Prizes.